Hamburg is a huge city with several district articles that contain information about specific sights, restaurants, and accommodation. The Free and Hanseatic City of Hamburg (Freie und Hansestadt Hamburg) is Germany's second-largest city and, at the same time, one of Germany's 16 federal states or Bundesländer. Prior to the formation of the modern German state, Hamburg for centuries enjoyed a status as de facto independent city state and regional power and trade hub in the North Sea. Although situated over 100 km (62 mi) upriver from the North Sea on the Elbe, Hamburg has been one of Europe's most important ports for centuries, as reflected in its full name referencing the Hanseatic League. The city was built upon a number of islands formed by the wide river and its larger and smaller tributaries, and a huge part of its southern half is occupied by the massive port. New and old town, this is the heart of Hamburg from the iconic city hall to the shopping mile of Mönckebergstraße and Hamburg’s answer to the London Docklands — Hafencity — with the old warehouse district. St. Pauli with its main street Reeperbahn is the centre for nightlife and home to one of the world’s best known red-light districts. Further west along Elbe there’s the hip district of Altona with a Danish past. Beginning with the lake Außenalster, the city’s north is rich in greenery and home to several parks and the city’s zoo. The colorful St. Georg district is at the same time bohemian and luxurious and home to people from many different cultures. Further east are the suburbs of Borgfelde and Hammerbrook. The cranes of one of the world’s major ports is visible far away. Though perhaps not the city’s major attraction, the port still defines the Hansestadt and is the home to the emigrant museum. Hamburg was apparently built as a defensive castle on the orders Emperor Charlemagne back in 808 AD. Being on the frontline was a very auspicious position, and Hamburg has been raided and destroyed multiple times by the Vikings, Danes and Poles during its history. Despite this, it was rebuilt every time and was even afforded the title of "Imperial Free City" (Freie Reichstadt), which it proudly bears to this day, in 1189 (just in time for the Danes to invade it again). Once Hamburg became an Imperial Free City, it established itself as one of the prime ports of Northern Europe, thanks to its favourable location up the navigable river Elbe, which prevented major storms from reaching it, and being almost equidistant from the North Sea and the Baltic. To gain access to the latter, Hamburg formed an alliance with Luebeck, which became the cornerstone of the Hanseatic League of ports of call and major trading centres around both seas, lasting up until the 17th century. Hamburg found itself constantly changing, rebuilding and expanding, both due to being constantly ravaged by either foreign invaders or more mundane fires and diseases, and due to the rapid growth in its wealth and might. This provided for both the expansion of the harbour and allowed for ambitious building projects to be completed (including the almost complete regulation of Elbe's tributaries, or Fleeten), and required the constant improvement of the city's defences. The most important thereof occurred when a new line of fortifications were created at the wake of the Thirty Years' War in the 17th century, effectively defining today's city centre (Altstadt - the former old town - and Neustadt, one formed by expanding the range of the walls), not only in shape but also in the street structure preserved to this day. Meanwhile Hamburg saw itself become a "free" city more than in just the name, first adopting Lutheranism during the Reformation and accepting protestant refugees persecuted in their home cities, and later allowing pretty much full religious freedom, becoming home to all kinds of religious minorities, including Sephardic Jews and even Catholics. The citizens (particularly the wealthy merchant elite) pressed against attempts to impose laws on them, and negotiated "recesses" from their rulers, which made Hamburg governed by a bicameral parliament with a relatively high degree of democracy and personal freedoms. 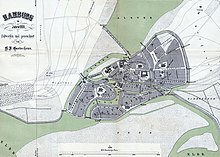 The extent of the great fire of 1842 (Hamburger Brand) - all the areas in the lighter shade were completely destroyed. The extent of the built areas of Hamburg at that time are marked by the darker red shade. Within post-war Federal Republic of Germany (initially only encompassing the western part of today's country), Hamburg retained its status as a separate state on par with the likes of Bavaria or neighbouring Lower Saxony. Larger in area only than fellow Free and Hanseatic Bremen, when it comes to population count and especially economic might (measured in GDP) it easily outshines many other states, including neighbouring Schleswig-Holstein and nearby Mecklenburg-Vorpommern, and rivalling the potent Saxony up the Elbe. A Hamburger (with a capital "H") is indeed a citizen of Hamburg, and all of them would proudly refer to themselves as such. If you find it funny, you won't find many people to share the joke with in the city. The modern beef patty sandwich you might have in mind is an American invention, even if there are many theories somehow linking its name to that of Hamburg, and has only come to Germany (and Hamburg) with the spread of American culture and fast-food chains. Meanwhile, Hamburgers have been referring this way to themselves for centuries. The "burger" meanwhile is always pronounced in the American way, while the "Hamburger" referring to a person is always pronounced the German way with the food item sometimes pronounced the English way. 53.629910.00541 Hamburg Airport (HAM IATA). is the fifth largest international airport in Germany, so arrival by plane is an obvious choice for those visiting from far away. There are plenty of connections within Europe, although only a few intercontinental direct services are offered. The airport has been thoroughly modernized with new terminals, airport hotel, streamlined infrastructure, and facilities that are by and large adequate, so you won't get lost. Depending on the gate your flight arrives at or leaves from, walking longer distances might be necessary as on any other airport too. Hamburg Airport is connected to the city by the S-Bahn S1 commuter train line, which connects to the Central Station (Hauptbahnhof) and the city centre in about 30 minutes. There are trains every 10–20 minutes, and a single fare is €3.30. Beware on the way back from the city centre to the airport: All trains are divided at Ohlsdorf, with only the first three cars going to the airport, and the rest going to the suburb of Poppenbüttel. The stop at Ohlsdorf does last about two minutes as they uncouple the cars, giving passengers one more opportunity to make sure they're in the right train. There are no trains between midnight and 04:00, but bus 606 runs along the same route. As there aren't any flights between 23:00 and 06:00 this may not affect your journey at all. Do consult the timetable for S1 for details. The airport, which is hugely popular with plane-spotters, is surrounded by Schrebergärten (meticulously maintained allotments), park lands, and open green spaces, criss-crossed by bicycle and walking trails. The popularity of this area is not only due to the many viewpoints, but also because Lufthansa Technik (Lufthansa's maintenance service) operates some large hangars on the airport, which means that the site is visited by a variety of rare and interesting aircraft (including VVIP). 53.5358339.8369442 Finkenwerder Airport (XFW IATA). On maps of Hamburg you can easily identify another airport right on the Elbe's south bank. Unfortunately, this airport is closed to public passenger traffic, as it is the site of an Airbus assembly plant. You can, however go plane-spotting in the neighbourhood and even visit the facility on a guided tour. See our guide to the southern part of Hamburg for details. 53.6469449.7044443 Hamburg-Uetersen Airport. Air Hamburg serves several German islands from this airport. The only way to reach it is by taxi, the nearest railway station being Tornesch. Hamburg has five major stations: 53.55277810.0063894 Hauptbahnhof (central station). , 53.5608339.9894445 Dammtor. (Messe/CCH), 53.5519449.9356 Altona. , 53.4561119.9916677 Harburg. and 53.48944410.2063898 Bergedorf. . The city being a terminus for many ICE as well as Intercity lines, trains tend to stop twice or even three times in Hamburg. Various types of train service are available. ICE (Inter City Express) high speed train service to or from most major German cities, including Berlin, Cologne (Köln), Düsseldorf, Frankfurt, Munich (München) also to Basel and Zürich Switzerland. There are usually hourly service to most destinations during the daytime. The Berlin to Hamburg route is a bit special; it has both ICE (fast, frequent, expensive) along with a few IRE (slow, infrequent, cheaper) trains. The IRE takes twice as long, but has a fixed price of €19.90 and €29.90 round trip as of 2018. This can be a great deal if booking on short notice. Direct service to or from Copenhagen and Aarhus (Denmark), Budapest (Hungary), Prague (Czech Republic), Vienna (Austria), and Bratislava (Slovakia) (via Dresden). Use the German railway's online trip planner to find connections to/from Hamburg and buy tickets. A7 to/from Kiel, Flensburg (north) — To get to the city exit at "Bahrenfeld". A7 to/from Hanover, Kassel (south)— To get to the city exit right after the "Elbtunnel" at "Othmarschen" or "Bahrenfeld". Use the rightmost pipe of the "Elbtunnel" to exit at "Othmarschen". Be prepared to pay for parking. Hamburg has a wide selection of P+R (Park+Ride) parking areas outside the city centre, where you can park either for free or for €2 a day and very easily use public transport to get into the city. Hamburg is one of just a handful of German cities that had a dedicated intercity bus terminal prior to the opening of the market in 2012/13. As such, the station amenities of ZOB Hamburg as it is known locally are likely a breath of fresh air compared to the city you arrived from. Flixbus has all but cornered the domestic market, but there are several operators for international destinations both near and far. The Elbe Radweg one of the most popular cycle routes in Germany passes through Hamburg. As it follows the valley of the not very steep river Elbe for most of its course it is a good choice for inexperienced cyclists as well as aspiring Tour de France participants. 53.538619.995511 Hamburg Cruise Center HafenCity, Chicagokai. Lübeck's port suburb Travemünde, about an hour away by train, is a major Baltic ferry port. You can leave Hamburg to the south (A7-Hannover/Frankfurt/Munich) and southwest (A1-Bremen/Cologne/Netherlands) from the filling station known as "HH-Stillhorn" you can get there with the number 13 bus from suburban station S-Wilhelmsburg. To Berlin you can start at the "Horner-Kreisel" and take the number 161 bus from S-Berliner Tor or walk from U3-Rauhes Haus. From the UK, it may be an idea to take a ferry to Denmark and then travel down rather than going via the Netherlands. Hamburg is an extensive city given its over 700km2, and visitor attractions are not all contained within the city centre. Fortunately, getting around is made easy by the extensive public transportation system. Walking is a good way of getting around in the centre, as pretty much around every corner is a sight to behold or a scenic lookout you might have missed otherwise. As many Hamburgers do, you may also opt to bike around. Driving is made relatively easy too by the wide thoroughfares intersecting the city in every direction, parking is paid but rates palatable and there is no requirement for your car to have an Umweltplakette. as well as ferries across the Elbe. Hamburg is the biggest German city without a Straßenbahn (light rail/ streetcar / tram) since it shut down its legacy system in the 1970s and despite numerous proposals and attempts to change that, there are no plans for a Straßenbahn network as of 2018. Hamburg has The S-Bahn and U-Bahn lines run partly over and underground, in the city, and in the outskirts. Sometimes you might meet the diesel powered AKN train as well in the northern districts. The only difference is that these are three companies, but there is a unified fare system. All train platforms have signs showing the next train, where it is headed, and how many minutes until it arrives. Trains are described by a number and the final station. Note that the final station may vary. For example, half of the S1 trains heading west go all the way to Wedel, but the other half go only as far as Blankenese. Note that train doors do not open automatically. You have to press a button or pull a handle on the door. Wait for the passengers to get off first before you enter. In the cold season, close the door after getting on the train if it looks like a longer stop. Either push the handle or press the closing buttons on the inside until the door is closed. All signs and notifications at stations and in trains are shown in at least two languages (German and English). Bizarrely Hamburg still has Bahnsteigkarten, otherwise long since abolished in all German cities except Munich and Hamburg. Basically they are required for people who wish to enter the platform area but do not wish to take a train. A Bahnsteigkarte costs thirty Cents and may be worth buying for novelty value alone. This also distinguishes Hamburg positively from its Southern peer where the same service costs the outrageous, near-robbery price of forty cents, which people in Munich can probably afford, given housing prices there. S-Bahn stations are marked with a green "S" and are often colocated with major long-distance railway stations and U-Bahn stations, allowing convenient transfers. While the S-Bahn logo is green, the trains are white-and-red like most German trains, and operated by Deutsche Bahn and feature a DB logo rather than the "S". It is easy to get confused by the variety of similar DB trains, so it is good to make sure you are boarding the S-Bahn you want and not a regional train. There are six S-Bahn lines in Hamburg, with some confusing numbering and arrangements. while all S-Bahn trains with two-digit numbers take the north route via Dammtor, Sternschanze (Messe) and Holstenstraße. All of the lines meet at Hauptbahnhof, which is also a station for all U-Bahn lines, and all lines save for the S21 also meet at Hamburg-Altona. From there, the S-Bahn lines radiate in 5 different directions. S1 links the far westward Wedel in Schleswig-Holstein and the neighbourhood of Blankenese with Poppenbüttel in the far north. In an unusual and potentially confusing arrangement, the first three cars of every train go to Hamburg Airport instead of Poppenbüttel, the division occurs at the station of Ohldorf. Note that the train reverses direction in Blankenese, so if you get on west of Blankenese, you have to take the last three cars to be in the front after the change of direction. There is, however, an announcement made on the train (also in English) before the trains are separated to let you know if you are in a car going to the airport or not. S11 is a truncated version of S1 operated in peak hours only, without the option to go to the Airport. This means that there is no direct link between the Airport and Messe Hamburg. S2, confusingly, is a rush-hour-only service that runs between Altona in the west and Bergedorf in the south-east. S21, a permanent service, is even more confusingly running along a different route than S2. It reaches farther south-eastwise, down to the suburb of Aumühle, but does not go to Altona and instead to Elbgaustraße in the far northwest. S31 is a truncated express version of S3 from Neugraben to Altona, operating permanently but skipping or alternating stations between peak hours and regular daytime. S-Bahn runs from approximately 05:00 until 01:00 in the central city, but there is often no service past 23:00 in outlying districts. On weekends, it runs all night. U1 (blue) forms a huge V with the bottom south in the Altstadt and top northern ends (both actually splitting in two) into residential suburbs. This line may be useful if you want to visit the western bank of Aussenalster, as it has stations relatively close to it. U2 (red) runs from the east to northwest. One particularly useful feature is that it stops at Messehallen (fairgrounds), allowing one to quickly move there from Jungfernstieg. U3 (yellow) is by far the most useful to a tourist, as it forms a loop around the Altstadt and Aussenalster. It can take you to the Rathaus, the old harbour (next to HafenCity), Landungsbrücken, St. Pauli and even to the Stadtpark. It also stops at Sternschanze, the other entrance to the Messe (fairgrounds). While the loop is around the Aussenalster in the broad sense, none of the U3 stations are close to it, so you need to change to a bus line to get to the lake. U4 (aqua) shares the eastern branch with the U2, but rather than northwest it loops south to HafenCity. All U-Bahn lines except U3 meet at Jungfernstieg, though U3 stops at the nearby Rathaus station and is accessible through an underground passage. Note that none of the lines goes to Altona - you need to take the S-Bahn or a bus to get there. U-Bahn runs from approximately 05:00 until 01:00 in the central city, but there is often no service past 23:00 in outlying districts. On weekends, it runs all night. Buses go around the clock. At night, a special "Nachtbus" (night bus) service connects the outlying districts and the city center. These buses depart and arrive at "Rathausmarkt", near the town hall and operate all through the night. Night buses are recognizable by their numbers which reach from 600 to 688. 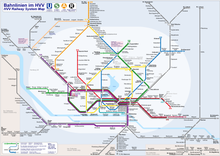 Apart from regular and nighttime bus lines, there are also Metrobus lines, designed to carry heavy loads on the most popular routes, in a way replacing a tram system that Hamburg does not have (similar to the situation in most of West Berlin). Metrobuses are designed to serve commuters mostly, and as such are not that useful to the tourists - in fact most lines do not even reach the core city centre. Public transport lovers will be delighted, however, to know that those lines are served by the longest bi-articulated low-floor buses in the world (the Van Hool AGG 300, also used by public transport operators in Utrecht). Be aware that there are a few special bus lines, called Schnellbus (fast bus). These have numbers in the 30 and 40 region, e.g. 36. These cost extra money, you can buy a Zuschlag ticket for €2.10 for any normal ticket you own (e.g. single or day ticket). In most circumstances you can avoid them because they are not really fast and most destinations can be reached by normal busses or trains. Riding on a bus is easy. You have to enter a bus at the front door and show your ticket to the driver or buy one. You leave through one of the back doors. On the lines 4, 5 and 6 this rule does not apply, you can enter through all doors. All busses feature information systems providing you with information about the next stop. Some even feature large information screens and free Wifi. Six ferry services operate in the harbour and along the River Elbe as part of the regular public transport system. Tip: take ferry line 62 from "Landungsbrücken" to "Finkenwerder" und then line 64 to "Teufelsbrück" or take ferry line 72 from "Landungsbrücken" in the HafenCity to "Elbphilharmonie". Sit back to enjoy a scenic trip through the harbour on a day ticket. Urban rail lines in Hamburg. Click on the picture to enlarge it. Hamburg's public transit operates on a proof-of-payment system; the tickets have date and time of purchase imprinted. Ticket inspectors make spot checks, but aside from that, you simply get on and off as you wish with no turnstiles or gates. You are required to show your ticket while entering a bus to the driver though. Single tickets range from €1.60 or €2.20 for short trips and €3.30 for Hamburg area to €8.80 for the entirety of Greater Hamburg. Vending machines in the rail stations (and at some bus stops) sell short-distance, single-ride, and day tickets. Group tickets are also available. On the buses, the driver will sell you what you need but only for cash. They will give you change but mostly won't accept larger notes like €50. An all-day ticket for Hamburg area (Ganztageskarte) costs €7.70 (2018), but if you start your travel after 09:00 or weekend, buy a "9 Uhr Tageskarte" (€6.40, Group Ticket up to 5 persons: €12). You can also buy a Hamburg Card, which includes the public transport system, museums, and other things, and is available at all ticket offices and from the bus drivers. To buy tickets for a week or longer, go to Hauptbahnhof or station Altona, get passport photos in the automated photo booth, and buy your pass in the information office. If your German is good or you have friends to help, you can also use the HVV App on your smartphone to buy tickets. This is easy and also will save you 3% on any ticket you buy. If you are traveling to Hamburg using a Niedersachsen-Ticket (Lower-Saxony-Ticket), Schleswig-Holstein-Ticket or Mecklenburg-Vorpommern (Mecklenburg-West-Pommerania-Ticket) for one to five people (€22-39), you have access to all the HVV lines. Try to avoid rush-hour before 09:00 and between 16:00-19:00. You are not allowed to take bicycles into subways before 09:00 and 16:00-18:00, unless it is a folding bike like a Dahon, Brompton, or Bike Friday. Folders are allowed on Hamburg public transit at any time of the day. On the two Alster lakes, a ferry boat travels once every hour from Jungfernstieg in the city centre to Winterhuder Fährhaus. These boats are not in the general HVV ticket system, thus more expensive, however, they offer a splendid view to some of the wealthiest neighborhoods of Hamburg. You will see a lot of bicycles on the roads during the warmer months, many of the cities residents will use bicycles as their normal form of transportation. Drive ways for bicycles are not available on all roads. In fact you will have to shift from on the road to a mixed foot and bike strip to a separated bike strip frequently. Drive safely! Several hotels within Hamburg provide residents with access to hotel bicycles. The city itself also offers bike rental services. This service is called StadtRAD, and there are kiosks located all around the city. To use this service, customers must register on the StadtRAD website and create an account with a credit card. Once the account has been created, you can go to any one of these terminals and use one of their bikes as long as you want. The first 30 minutes are free, any subsequent time costs 8 cent/minute and the maximum charge is €12 per day. Alternatively, Hamburg City Cycles (working with the bicycle store next door) rents bicycles for €23 for 2 days and €7 for each additional day. Hourly rates are also available. The bicycles are large "cruiser" style bikes and the rental includes a lock, air pump, and toolkit if desired. You can take your bike with you on the harbor ferries (e.g. line 62) free of charge. There is a good supply of taxis in Hamburg 24 hours a day, both at taxi stands and in the streets. You can identify a taxi rank by a green box on a post somewhat like an oversized parking meter or alarm post. You will have to wait there or phone one of the numbers below, since the boxes can not be used to call a cab. Almost all vehicles are still in the traditional ivory white colour, but even if not, a yellow and black sign on the roof reading "Taxi" indicates a licensed cab. As usual, the sign is switched on to indicate vacancies. The taxi start at €2.90 plus €2.20/km. A trip in the city area will between €7-15. For a trip from the city to the airport, expect to pay between €20-30. Most taxis accept credit card payments. Parking in the city centre: most possibly, you will have to pay for parking. However, the maximum fee is €12 for 24 hours. This is a viable option if you would like to walk around the central area and you/your friends will not use the public transport. Parking in HVV P+R (Park & Ride): HVV offers free parking lots outside of the city centre. The idea is that you leave your car there and use the public transport to get around. If you and/or your company merely would like to travel around the city centre on foot, the first option is cheaper and makes more sense. The entirety of the city centre is worth walking throughout, as it is jam-packed with varied and truly interesting sights. Those range from the iconic Speicherstadt and Hamburg's five main historic churches, through the upscale area around the Binnenalster artificial lake and the town hall (Rathaus) to the ultra-modern Hafen-City. The centre is where the majority of Hamburg's canals and bridges are, as well as the old quays providing great views across the Elbe. There is also an unusual array of museums to visit. St. Pauli is the bustling district for party, non-mainstream shopping and Hamburg's largest funfair. The city's trade fairground (Messe Hamburg) and CCH (Conference Centre Hamburg) are also there. Altona has a long quay, with both the historic Landungsbrücken and parts still in active use, such as the Cruise Terminal and fishing harbour. St. Georg immediately east of the Hauptbahnhof is a warm and welcoming area full of cafes and renowned for its gay culture, and it has the most upscale part of Außenalster's lakeside. The North is the greenest part of Hamburg, with the rest of Außenalster and numerous other parks, like Hagenbecks Tierpark the famous Zoo established 1907 by Carl Hagenbeck, who was the pioneer behind "Zoos without bars". Hamburg publishes a thick, detailed booklet of local museums called "Museumswelt Hamburg". You can find the Museumswelt Hamburg at the information desk at any of the museums. Hamburg is part of the worldwide Global Greeter Network (free sightseeing tours given by local volunteers). You can make a trip on the river Elbe with the line 72 from Landungsbrücken to Elbphilharmonie, or the line 62 about Museumshafen Oevelgönne to Finkenwerder, and the line 64 to Teufelsbrück. Bicycles free of charge. Adults one trip: €1.90/€2.95, day card: €5.80/€7.10. The public ferries are part of the public transport system, meaning day tickets for buses, subway and interurban trains are valid for the ferries as well. These public ferries (which prominently feature their line numbers) must not be confused with sightseeing ships and the private ferries that operate between Landungsbrücken and the musical theatres on the other side of the Elbe. The best way to explore Hamburg's extensive waterways (Hamburg has more bridges than Amsterdam, Venice and London combined) is on a ferry or pleasure boat. A variety of boat tours lasting from 50 minutes to 3 hours depart regularly from the Jungfernstieg on the Inner Alster lake. The exact offer varies depending on the season, so do check in advance or at the landing stage to see what's available. The simplest and shortest tour is the Alsterrundfahrt or Alster tour that lasts 50 minutes and takes in the Inner and Outer Alster lakes (adults €15). The small cruise boats are often hired for weddings. One is an old steamer. Contact Alster Touristik on 35 74 24-0 or check out the website at www.alstertouristik.de. Theater im Hafen specializes in musicals, such as The Lion King, which opened in 2001, and still playing as of 2015. Next to it, the Theater an der Elbe under construction. Both are accessible by ferries from the northern bank of Elbe. Hamburg has an opera house, venues where classical music is performed and many theaters. The city offers a number of different musicals, as well as other music events. Most of these venues are located either in the central or the eastern parts of the city. If you prefer less formal venues, head to St. Pauli. Neue Flora: Das Phantom der Oper produced by Andrew Lloyd Webber. Theater im Hafen: König der Löwen (The Lion King) produced by Disney. All musicals are in German language, regardless of their origin. If you're still interested, make sure to buy tickets early, many shows are sold-out. But, midweek there is a good chance that you will be able to buy last minute tickets at a highly discounted price of €40 regardless of price category, age, or occupation. Watch a home soccer game by one of the city's teams HSV in the Bundesliga and FC St.Pauli in the 2. Bundesliga. Hamburg Blue Devils — Fourfold German American Football Champion due to financial struggles they had to relegate themselves into a lower division prior to the 2014 season. They are making their way back up through the leagues. Hamburg Stealers HSV-aligned baseball club, with field located near Hamburg Airport. HSV Handball is the local (Olympic) handball team, playing their matches at the modern o2 World Hamburg (formerly Colorline-Arena), right next to the Volksparkstadion. Hamburg Freezers share o2 world with HSV Handball. The premier-league ice hockey team features many international top class players. The German Open in Men's Tennis are held at the Rothenbaum in Hamburg. The tournament is one of nine ATP Masters Series tournaments. Deutsche Bank Players’ Championship, at the Gut Kaden Golf and Land Club. Golf tournament of world class, prize money €600,000. Vattenfall Cyclassics — World Cup and public bike race. Holsten City Man — The only German Triathlon World Cup. Conergy Marathon Hamburg — Usually in spring, open to the public. Port Anniversar 2013 with ship "Mein Schiff"
Night of Museums in April is big in Hamburg. Over 50 places take part and are open till 02:00. Entrance to museums is not free, but the cost is symbolic, ticket everywhere (plus public transportation) costs €12 (discounted €8). Fischmarkt (Fish Market) — Every Sunday morning vendors praise wares of virtually every type at Hamburg's oldest open-air market, dating back to 1703. The market takes place at the foot of the century-old Fish Auction Hall, where live-bands perform jazz, skiffle, country, or western music. Open every Sunday from 05:00-09:30, in winter from 07:00-09:30. Hafengeburtstag (Harbour Birthday). Every year in May the harbour birthday attracts millions of people. Dozens of stands and stages, a ship parade, and changing events are organized to celebrate the cities spring of wealth. The harbour filled 800 years in 1989. Since then, the Harbour Birthday grew the greatest harbour party in the world. It is generally in early May. Kirschblütenfest (Japanese Cherry Blossom Festival). On May 19, the Japanese community of Hamburg celebrates the Japanese Cherry Blossom Festival by the Lake Alster. Enormous fireworks and a peaceful atmosphere are characteristics of this event. Schanzenfest, in Schanzenviertel is self-organized and full of peace and happiness until it ends around 22:00 in fighting between a crowd and the police. Stuttgarter Weindorf — Vintners from southern Germany present their products at the Rathausmarkt (town hall square). Schlagermove Parade, a parody on the Berlin Loveparade with schlager instead of techno music. Hamburg Pride, the Gay Pride Parade usually takes place in August and moves from the Central Station through the shopping streets to end at the Jungfernstieg with the set up party tents. There are a number of small beaches on the North side of the Elbe river between Övelgönne and Rissen, the one in Övelgönne being the most popular one due to its proximity to the city centre. Swimming in the Elbe is not forbidden, but the water is not of high quality, and strong currents occasionally lead to casualties. Swimming is more common at Blankenese beach and Falkensteiner beach than at Övelgönne beach. Stay close to the shore. You may have a barbecue there in the evenings, as long as you bring a grill and clean up after yourself. Watch out for surprisingly large waves created by large ships passing by and stay clear at least 50m of any structure in or reaching into the water! See Stay Safe below! In addition, there are a usually number of commercial beach clubs during the summer, usually between Fischmarkt and Övelgönne. Other than the name might indicate, these are bars open to the public. From Altona, bus 112 leads to (and terminates at) Övelgönne. Commuter railyway S1 leads to Blankenese, from there bus 48 leads to the beach. Falkensteiner beach can be reached from commuter railway stop Othmarschen with bus 286 (stop at Tinsdaler Kirchenweg, then it's a 15-minute walk). There are some OpenAir Festivals around Hamburg. One is the Wutzrock Festival. It is free of charge and near the city, so you might check it out if you happen to visit Hamburg in late August. It takes place at the "Eichbaumsee" next to the Trainstation "Mittlerer Landweg" (via S-Bahn 21 to Aumuehle/Bergedorf) usually the last weekend of August. There are 11 universities in Hamburg, the biggest of which is the University of Hamburg. Many courses and programmes are held in English. Hamburg is home to schools from countries such as Japan, Sweden, France, Britain and more, where the pupils are taught in their native language. The International School Hamburg opened in 1957 as the first of its kind in Germany. The harbour is the fastest growing job sector in Hamburg. Numerous minor and major companies work in that area. You should be able to speak German because due to the high unemployment rate in Germany's jobseekers are attracted by the relative lower unemployment rate in Hamburg. This results in high numbers of applications. Hospitality and media are the two main other industries. Note that living costs in Hamburg may be significantly higher than in other big cities in Germany depending on your demands. Due to heavy destruction during World War II especially apartments in older Victorian style homes built at the beginning of the 20th century are rare but highly demanded. Be prepared to compete for apartments in attractive areas in town with well-paid media professionals, freelancers and spoiled kids with unlimited resources in their parents' bank account. Inner city areas have become quite popular among doctors, lawyers and architects as well in the last years. Full shopping tour starts at central station, down to town hall, then Poststraße towards Gänsemarkt square and back on Jungfernstieg at the Alter lake side. The main shopping area of Hamburg is the 53.551410.00281 Mönckebergstraße in the centre of the city. This area features the stores you're guaranteed to find in major German cities such as Galeria Kaufhof, Karstadt, C&A and Saturn and further west fashion stores of common international brands. Take the subway to either central station, Rathaus (town hall), or Mönckebergstraße. Also check the side-street Spitalerstraße. Northwest of town hall towards Gänsemarkt are the more pricey shops like Hugo Boss. The 53.56179.96592 Schanzenviertel is also getting more popular nowadays for unique designer boutiques. Younger people especially enjoy being here. Subway "Sternschanze"/"Feldstraße"
Shops are mostly open daily 10:00-20:00 and on Thursday and Friday until 22:00. Original Hamburg dishes are Birnen, Bohnen und Speck (Low Saxon Beren, Bohnen un Speck, green runner beans cooked with pears and bacon), Aalsuppe (Low Saxon Aalsupp/Oolsupp, often mistaken to be German for “eel soup“ (Aal/Ool translated ‘eel’), however the name probably comes from the Low Saxon allens [ʔaˑlns], meaning “all”, “everything and the kitchen sink”, not necessarily eel. Today eel is often included to meet the expectations of unsuspecting diners. ), Bratkartoffeln (Low Saxon Braatkantüffeln/Brootkantüffeln, pan-fried potato slices), Finkenwerder Scholle (Low Saxon Finkwarder Scholl, pan-fried plaice), Pannfisch (pan-fried fish), Rote Grütze (Low Saxon Rode Grütt, related to Danish rødgrød, a type of summer pudding made mostly from berries and usually served with cream, like Danish rødgrød med fløde) and Labskaus (a mixture of corned beef, mashed potatoes and beetroot, a cousin of the Norwegian lapskaus and Liverpool's Scouse (food), all offshoots off an old-time one-pot meal that used to be the main component of the common sailor's humdrum diet on the high seas). Alsterwasser in Hamburg (a reference to the city's river Alster with two lake-like bodies in the city centre thanks to damming), a type of, a concoction of equal parts of beer and carbonated lemonade (Zitronenlimonade), the lemonade being added to the beer. Mexikaner is another local specialty, a shot drink with vodka (or similar), tomato juice, chili and Worcester sauce that resembles a bloody Mary, but is knocked back in one go. There is a lot of good-natured rivalry between bars as to who can concoct the best Mexikaner, so if the concept appeals, be sure to taste how it differs from place to place. Hamburg is also home to a curious regional dessert pastry called Franzbrötchen. Looking rather like a flattened croissant, the Franzbrötchen is somewhat similar in preparation but includes a cinnamon and sugar filling, often with raisins or brown sugar. The name may also reflect to the roll's croissant-like appearance – franz appears to be a shortening of französisch, meaning "French", which would make a Franzbrötchen a “French roll.” Being a Hamburg regional food, the Franzbrötchen becomes quite scarce outside the borders of the city; as near as Lüneburg it can only be found as a Hamburger and is not available in Bremen at all. Ordinary bread rolls tend to be oval-shaped and of the French bread variety. The local name is Rundstück (“round piece” rather than mainstream German Brötchen, diminutive form of Brot “bread”), a relative of Denmark's rundstykke. In fact, while by no means identical, the cuisines of Hamburg and Denmark, especially of Copenhagen have a lot in common. This also includes a predilection for open-faced sandwiches of all sorts, especially topped with cold-smoked or pickled fish. The American hamburger seems to have developed from Hamburg's Frikadelle: a pan-fried patty (usually larger and thicker than the American counterpart) made from a mixture of ground beef, soaked Staling, egg, chopped onion, salt and pepper, usually served with potatoes and vegetables like any other piece of meat, not usually on a bun. Many Hamburgers consider their Frikadelle and the American hamburger different, virtually unrelated. The Oxford Dictionary defined a Hamburger steak in 1802: a sometimes-smoked and -salted piece of meat, that, according to some sources, came from Hamburg to America. Every day, you can get vegetarian food for donation (€1.50) in different places check out on this site. A very easy Turkish food to find in Hamburg is Kumpir, a stuffed baked potato, served with salads, appetizers and sauces. Mostly veg, non vegetarian options are also available. Impossible to find in the Turkish neighborhoods in Berlin, it's very popular in Hamburg. In the Hauptbahnhof (Central Station), there are a lot of snack bars to have a quick meal. While there are probably not many vegetarian snack bars, there is a fairly decent selection of veggie food to be found, such as croissants with brie cheese and meat-free pizza slices. If you want to relax and drink a coffee in some cafes go to 53.555510.00841 Lange Reihe. Many bars, cafes and restaurants all along the street. Although the Lange Reihe is the heart of the gay community, most places are jointly visited by straight and gay people of any age. All places are gay-friendly, and many are gay-owned or gay-run. Reeperbahn in St. Pauli is the place to go for late-night, all-out partying. Information on parties and other news from the gay scene. There are plenty of hotel rooms across Hamburg and, although not a cheap city in general, you may find the price range to include much more affordable choices than in other northern metropoles. There are many higher-end hotels within the small central Neustadt-Altstadt area, but you options are certainly not limited to those. Hotels around the Aussenalster in the North provide relaxed comfort, while further up north you will find hotels closer to the airport, convenient for those arriving by air. The Atlantic and the Vier Jahreszeiten share the prize of Hamburg's best hotels over the last one hundred years. Emperors and movie stars have stayed there, including James Bond (Tomorrow never dies, 1997). The luxurious hotels at the waterfronts of the Alsters is actually reminiscent of Geneva. Altona and St. Pauli contain both hotels aimed at business travellers arriving at the trade fairs and those along the coastline, offering great views at different prices. There you can find hotels at the other end of the price scale, catering to people who've come to take part of the city's nightlife. East of the centre, in turn, you will find more business hotels and budget accommodations, usually very conveniently linked with the centre, but often less expensive due to their unspectacular location. Finally, the South has a very small supply of accommodation options, but those can be worth reviewing by those arriving by car. Contrary to what one might suspect from a city with such a cosmopolitan perspective and media presence, Hamburg does not have that many free WiFi spots. This is due to peculiar German legislation, which Hamburg's senate has decided to challenge in late 2014 with the goal of providing free wireless Internet at least in the city centre by 2020. Until then, free WiFi can be obtained in main train stations (in particular, Hauptbahnhof and Hamburg-Altona) and in some cafes and restaurants. Do note that not all of gastronomic outlets provide free WiFi - do check before you sit down there to avoid disappointments. Another way is to simply buy a German prepaid SIM-card - as of 2015, 1GB can come as cheap as EUR 10, and 5GB at EUR 20. If you do not want to carry two phones or change the SIM-card in your regular phone, a solution can be to buy a standalone WiFi device to put the card into. Hamburg is generally a safe city. Watch out for pickpockets, especially in the area around the Mönckebergstraße, Central Station, on the Reeperbahn, in buses and trains, but also on crowded escalators and other crowded places. Keep your distance from protest marches unless you wish to get involved: both leftist groups and the Hamburg police are known for their heavy reactions in such situations. Bathing in the River Elbe is possible but, of course, you must keep out of the way of ships. Swimmers can be thrown about and even totally swamped by the wake from ocean liners. Swimmers should also stay away from structures in the river and strictly avoid an area about 50 m around those extending into the river. Strong underwater swirls going down as deep as 10–15 m and even close to the beach may pull the strongest swimmers under water. When relaxing on one of the beaches along the riverside, keep several metres away from the water's edge and keep an eye on children playing in or near the water. Container ships passing by sometimes create surprisingly large waves that won't just get your feet wet on the beach, but may also drag you into the Elbe. Swimming in the Outer Alster lake is possible, though swimmers are rarely seen. The water is fairly clean. The lake is only about 2–3 metres deep. Note that the Hamburg police wear dark-blue uniforms, unlike the federal German police and many of the other state police forces in Germany, which still wear green uniforms. Tap water is very clean and you can drink it without any exception, even use it to provide baby food. Both North Sea and Baltic Sea beaches are reachable within an hour by car, railway, or bus. As Hamburg is a port city several ferries and cruises as well as freight ships can get you to (almost) everywhere in the world as well. Bremen — A hanseatic city 95 km away, famous for the Bremer Stadtmusikanten (Town Musicians of Bremen). Helgoland — Germany's most off-shore North Sea island. Reachable by express ferry from St. Pauli Landungsbrücken. Kiel — Kiel's main tourist attraction is the "Kieler Woche" (Kiel Week) at the end of June, the largest sailing event of the world and one of Germany's largest festivals. Kiel is also notable as one of the most important historic bases of the German Navy as well as its U-Boats, and several sights related to this history can be viewed in Kiel and the suburb of Laboe. Trains to Kiel leave at least once per hour from Hamburg main station and the trip takes about an hour. A trip to Kiel on the Autobahn (A7) takes about an hour, too. Lübeck — The city is connected to the Baltic Sea by the Trave river. The old city (Altstadt) survived from medieval times and is part of the UNESCO World Heritage List. About 60 km northeast of Hamburg, direct trains leave from main station every hour. Lüneburg — A city in Lower Saxony, about 50 km southeast of Hamburg. Like Lübeck, Lüneburg's old town has kept a medieval look with old buildings and narrow streets. The town is situated in the beautiful Lüneburger Heide. South of Hamburg, direct trains leave from main station every hour. Altes Land — The region is the biggest connected fruit growing area of Central Europe and the one the furthest north in the world. The main product grown in this area are apples in astounding variety. Altes Land is an area of marshland south of the river Elbe in Hamburg and Lower Saxony around the old towns of Stade, Buxtehude, and Jork. A characteristic feature is the richly-decorated farmhouses with their elaborate gateways. Ahrensburg — Northeastern suburb of Hamburg, situated in Stormarn district. Its outstanding sight is the Renaissance castle dating from 1595. Ahrensburg is easily accessible by car and train (Hamburg public transport). Sankt Peter-Ording — Germany's most popular tourist destination by the sea. Features a broad surfer's beach and stilt houses. Easily accessible by car (Autobahn 23, about 120 km) and train. This city travel guide to Hamburg has guide status. It has a variety of good, quality information including hotels, restaurants, attractions and travel details. Please contribute and help us make it a star! This travel guide page was last edited at 18:09, on 13 January 2019 by Wikivoyage user ThunderingTyphoons!. Based on work by Wikivoyage users Traveler100bot, MartinJacobson, MSG17, Hobbitschuster, Matroc, Wrh2Bot, Spekulatius2410 and Ground Zero, Wikivoyage anonymous user 213.209.125.192 and others.